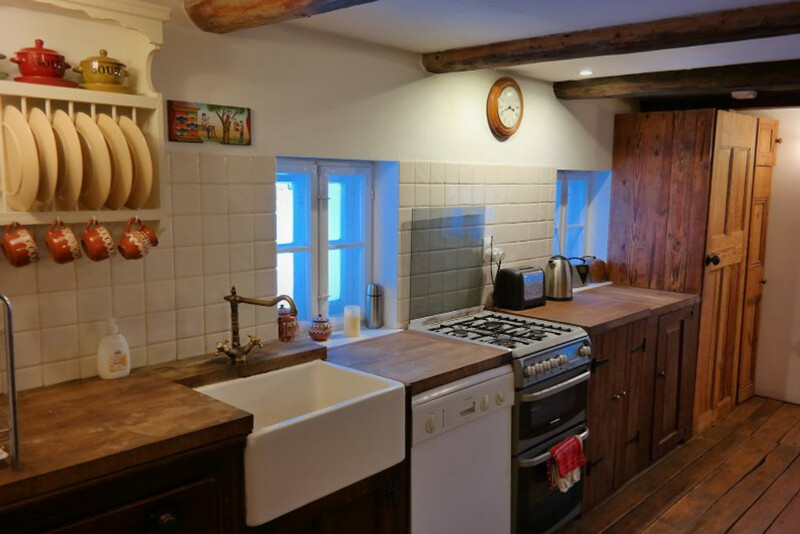 200 year old timber-framed former bakery. 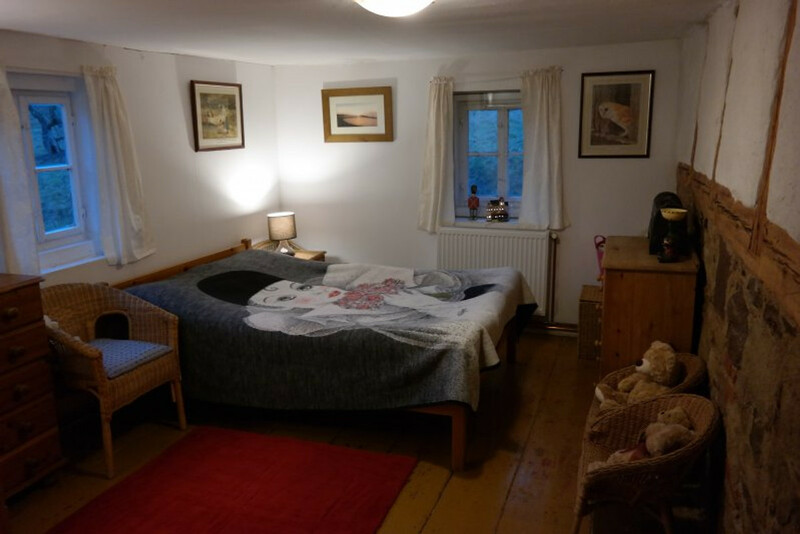 Three double rooms and option of a fourth. Sleeps up to 8 adults with extra space for children. One wood-burning and one coal/wood stove. Great for outdoor activities. Large, enclosed garden with extensive meadow to rear. 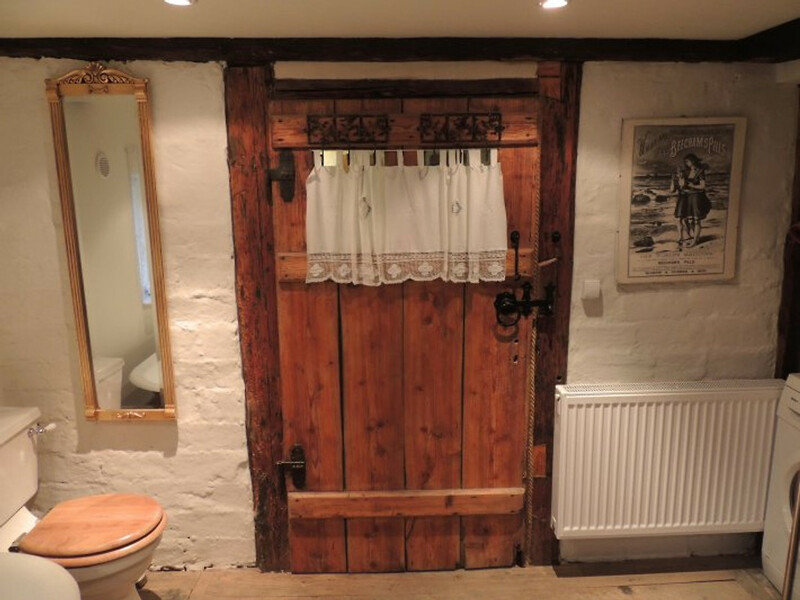 This cosy, romantic cottage has all modern conveniences as well as beautifully-preserved features including: sandstone archways, farmhouse-style flagstones, original interior and exterior doors, wood and coal-burning stoves, wattle and daub walls with lime plaster etc. 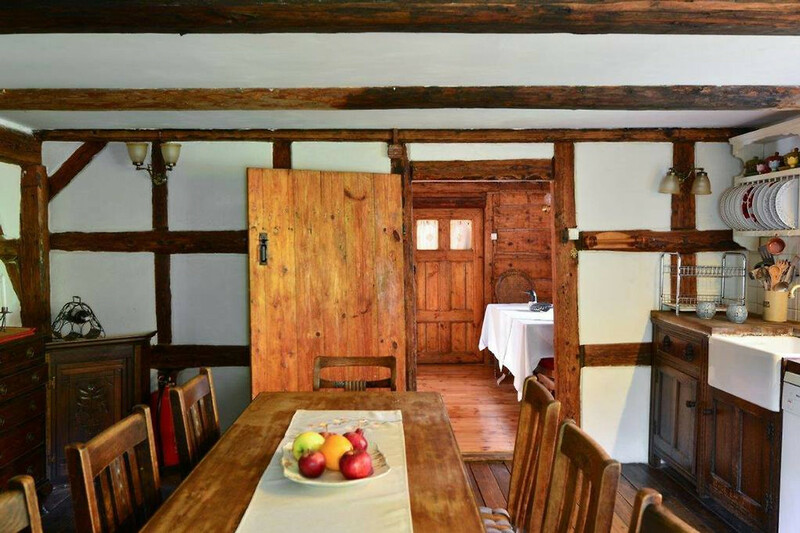 Inside it looks like a well loved home thanks to an interesting mixture of antique furniture and wooden floors. The downstairs Music Room has a piano and a wood/coal stove. 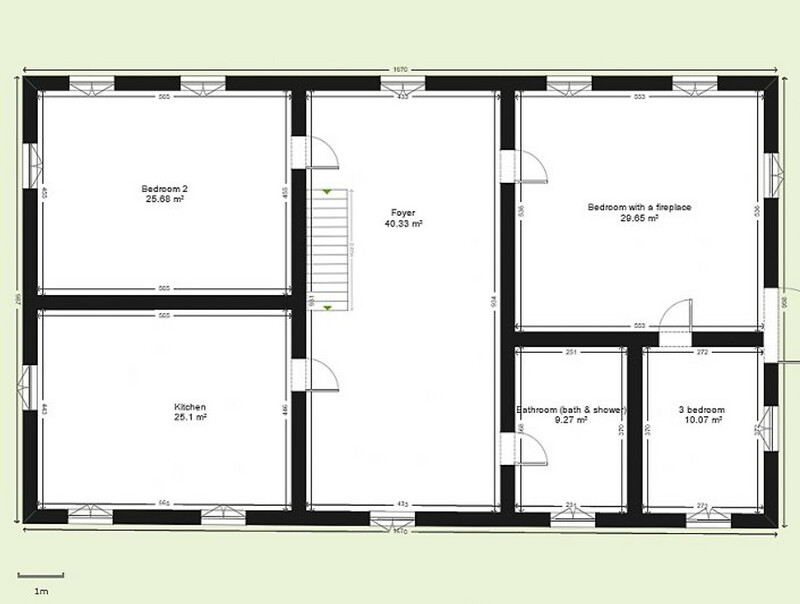 This room can double as a 4th bedroom as there is a sofa bed here, with an adjacent bathroom. 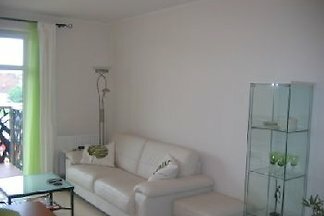 On the first floor there are 3 bedrooms (2 very large 30sqm doubles and 1 smaller double). 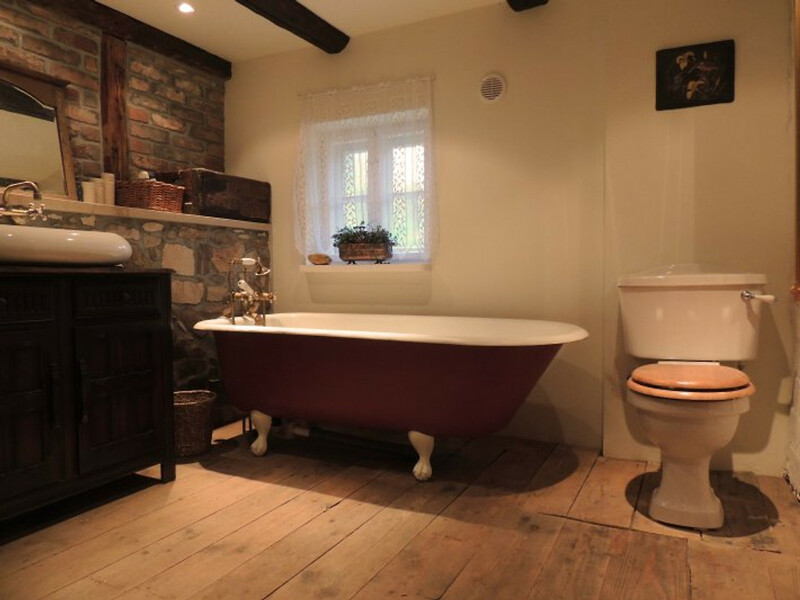 There is also one main family bathroom with a Victorian bath, wet room shower, basin and toilet on the first floor. 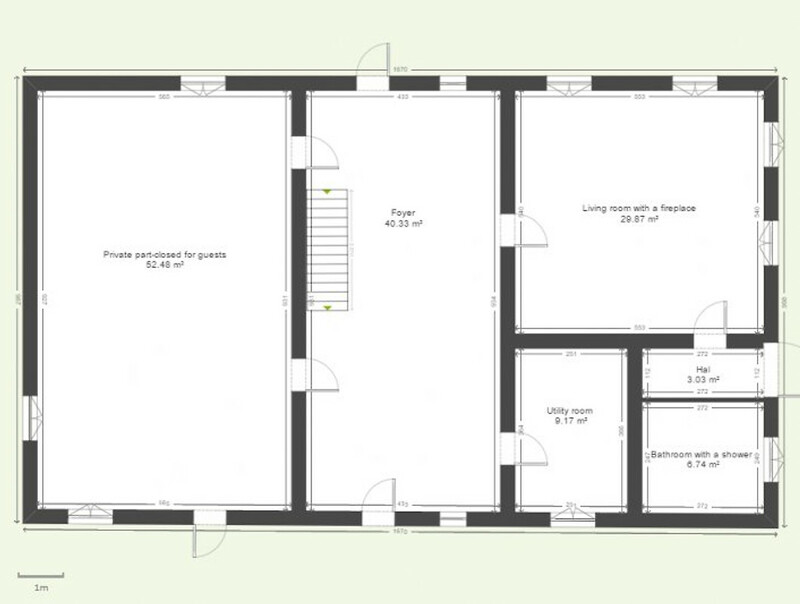 There is a very large kitchen with dining table big enough to seat 8 with further dining space for 4 people. 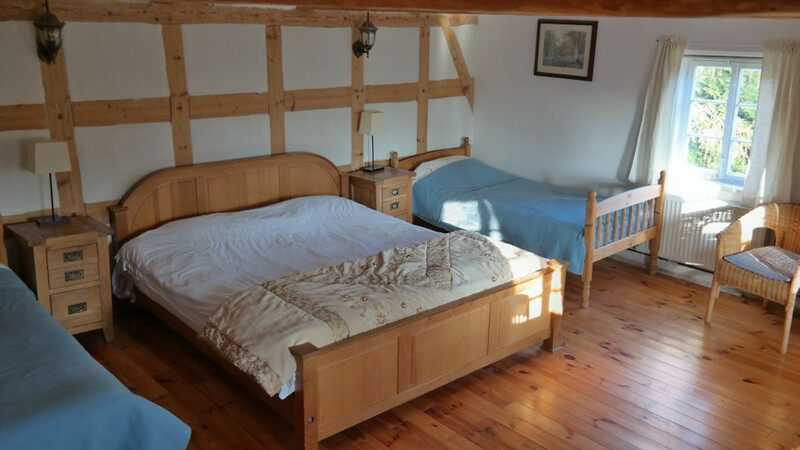 Guests have access to the whole house, garden, swimming pool (summer only) and meadow. 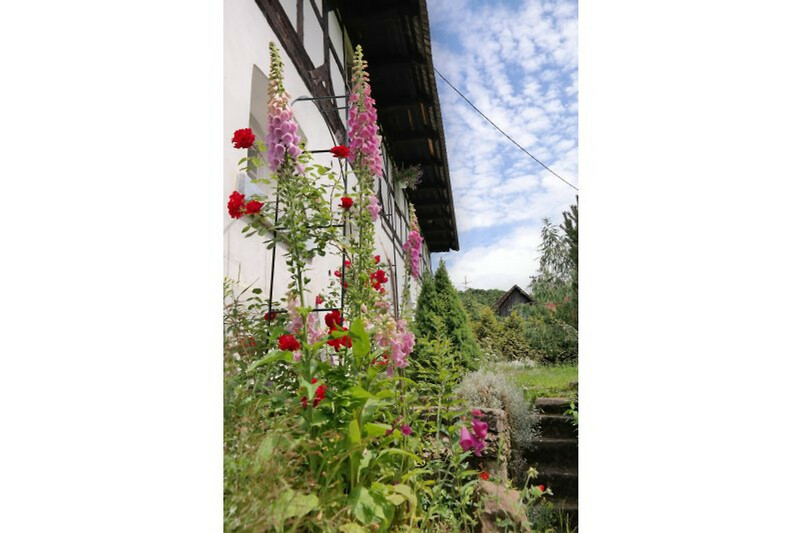 The upper part of the garden and meadow has panoramic views across unspoilt farmland and the Sudety Mountains -an ideal spot to relax. 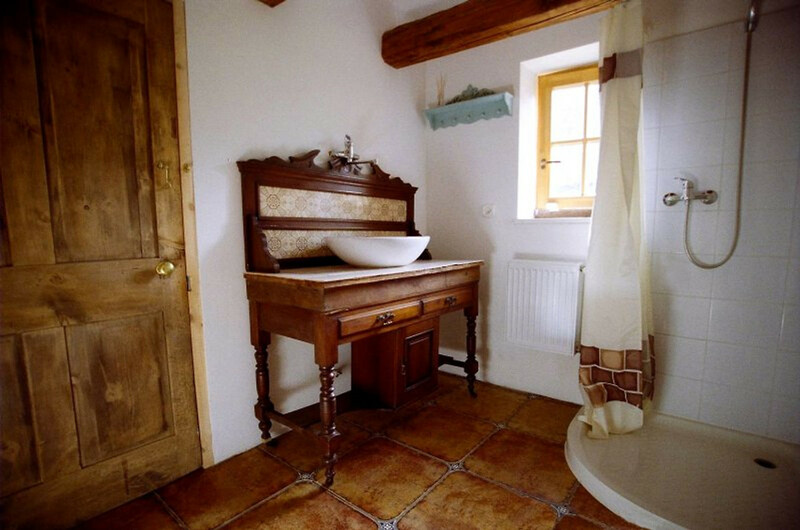 To the rear of the cottage is a large enclosed and private lawned garden complete with garden furniture and barbecue. The setting is a walkers’ and bird watchers' paradise with countless walks both in the neighbourhood and further away (Karkonosze mountains routes). A kayaking trip along the wide and languorous rivers through the region is sure to provide an unforgettable experience. The closest spot is just 4km away on the beautiful river Bobr. For those who prefer the challenges of extreme sport, numerous climbing trails await. And in winter there are superbly prepared ski runs. Lovers of horseback riding will find open space, forest trails, picturesque valleys and rolling hillsides (nearest horseback riding is found 8km away). Many visitors are attracted by the Karkonosze Mountains, one of the most valued recreational and leisure areas in Poland. Jelenia Gora ( 15km away) is an ideal base for trips to the Karkonosze Mountains. The town has a number of architectural buildings and other elements from various periods, some of which can be found in the intricately renovated Old Town. 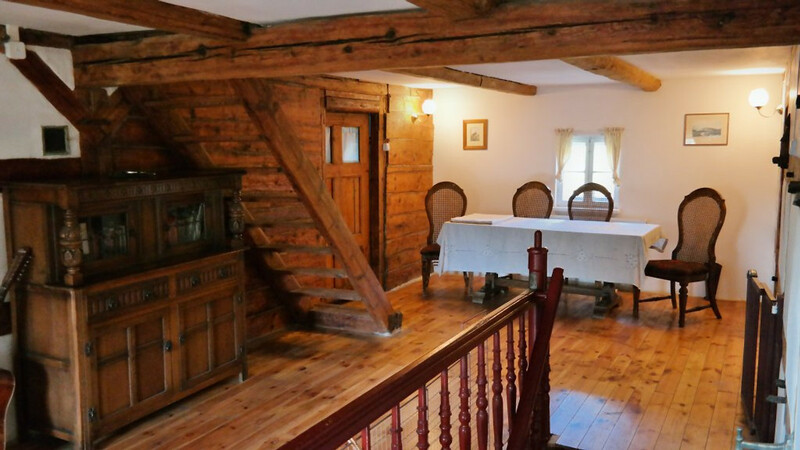 Superb stunning Polish holiday location ideal for cycling, walking, camping, bird watching, horse-riding, kayaking, fishing or even sking in winter. Perfect for short stay vacations or longer breaks where you and the family and friends can seriously unwind. 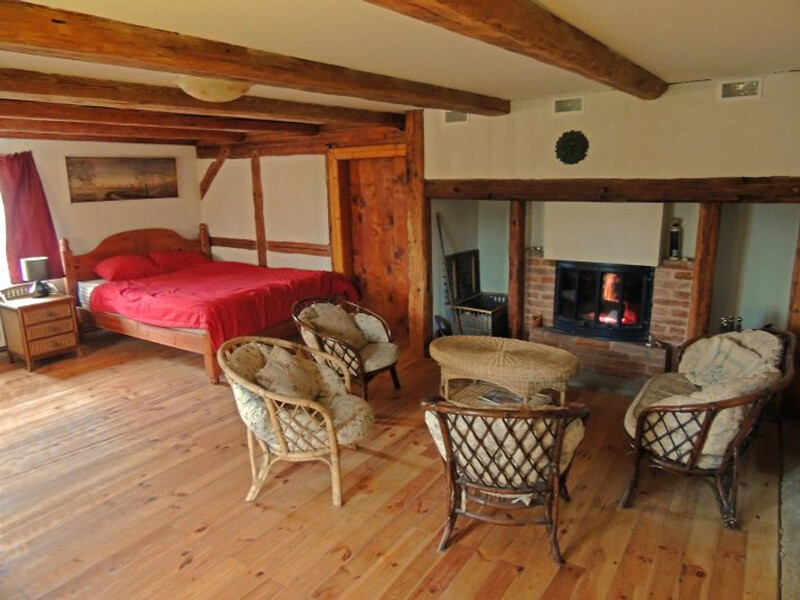 The house has featured in the Polish monthly magazine "Weranda Country" due to the renovation techniques in keeping with traditional styles and methods. Note though, this article is only in Polish. There is an old 1920s pianola downstairs which currently only works as a piano and may be used by any aspiring musicians. We have been trying to find someone to fix the bellows to enable the pianola itself to work as we have a number of vintage pianola rolls (the internal mechanism works fine). Cost of linen, towels, coal, gas, electricity and water are all included. The only chargeable extra would be 30 Euros for one or two pets. For 3 or more please contact to discuss. Wlen is a town approximately 75km south west of Wroclaw airport and 100km east of Dresden airport. Cars can be hired from Wroclaw airport (and regular trains run from Wroclaw train station to Jelenia Gora and on to Wlen. The drive from the airport takes about 90 minutes. Driving from Germany – the E40 from Dresden to Gorlitz will be the best place to cross the Polish border. Route from Gorlitz/Zgorzelec (German/Polish border)– follow road 30 to Luban then Gryfow Slaski,Lubomierz, Wojciechow and Wlen. 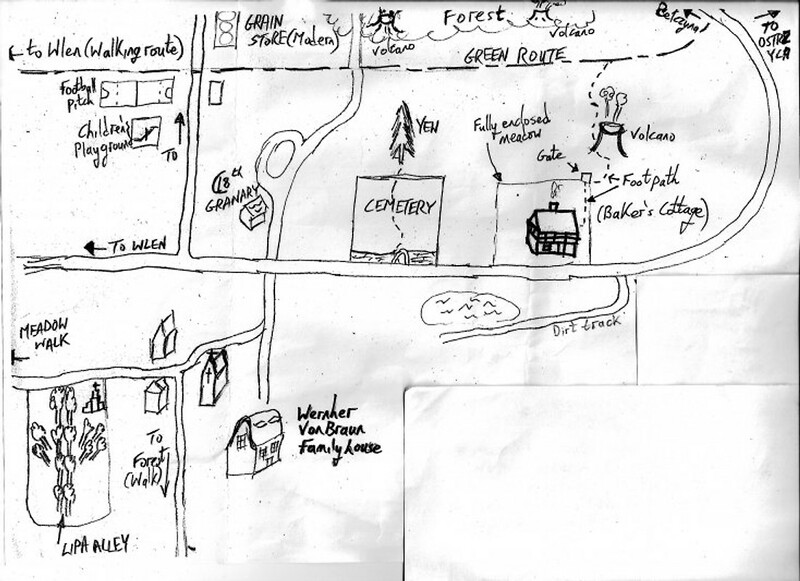 Sat nav co-ordinates will be forwarded upon receipt of booking. We are Paul and Anna - English and Polish respectively; professional people formerly working as a Microbiologist and Exam officer for the University of Oxford. We have many, varied interests including travel, culture, history, etc. We are passionate about our house and have been restoring it for almost four years now, by traditional methods; techniques we knew nothing about prior to purchasing this near-ruin as it formerly was. Most of the work we did ourselves. The Holiday home has 8 reviews. Wir waren zwei Familien mit insgesamt 4 Erwachsenen und 4 Kindern und hatten mehr als ausreichend Platz in diesem Haus. Das Haus hat einen sehr rustikalen Charme und wurde mit sehr viel Liebe zum Detail und sicherlich hohem Aufwand so originalgetreu wie möglich wieder hergerichtet. Es ist ideal zum Entspannen für nostalgische Romantiker und stellt eine interessante Alternative zum Urlaub in lärmenden Tourismuszentren dar. Die gemütlichen Abend in dieser historischen Behausung vor dem lodernden Kamin werden gewiss unvergesslich bleiben. Der Ort in welchem sich das Haus befindet ist über weite Strecken so ursprünglich erhalten, als wäre die Zeit vor hundert Jahren stehen geblieben. 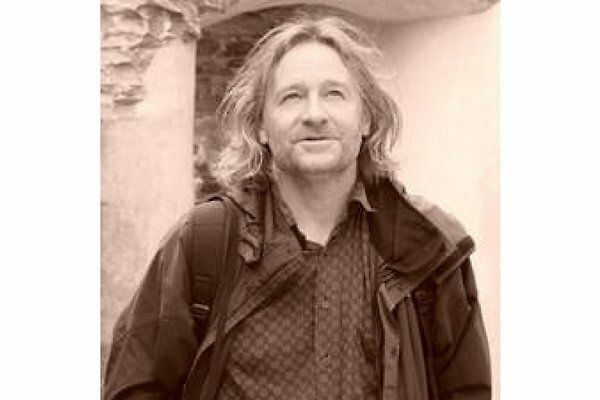 Man kann durch die Felder und auf unbefestigten Wegen wandern und Sachen entdecken, welche völlig abseits der üblichen touristischen Pfade Geschichte atmen. So zum Beispiel das Wohnhaus der Familie des Wernher von Braun oder den in einem Wald verborgenen alten deutschen Friedhof, welchen uns ein hilfbereiter alter Dorfbewohner zeigte. Man kann aber auch direkt hinter dem Grundstück den Berg hinauf kraxeln und mit ein wenig Anstrengung in kurzer Zeit die Spitze eines erloschenen Vulkans erreichen, welche in früheren Zeiten mit einiger Sicherheit eine heidnische Kultstätte war. Von dort hat man einen wirklich atemberaubenden Ausblick über das ganze nördliche Riesengebirge bis zur Schneekoppe. Auch der Nachtschlaf ist in dieser Gegend sehr erholsam, da es nach dem Löschen des Lichtes wirklich richtig dunkel und ganz still ist. Morgens wird man dann von der erwachenden Natur geweckt. In ca. 5 km Entfernug gibt es den kleinen Ort Wlen, wo man in einem Supermarkt und einigen kleinen Läden das nötigste kaufen kann. Zu Empfehlen ist auch das Cafe im Palac Lenno. Wer hingegen richtig essen gehen oder groß einkaufen bzw bummlen will muss schon die 20 km bis Jelenia Gora oder noch etwas weiter bis Karpacz fahren. Dort gibt es dann aber alles, was das Touristenherz begehrt. 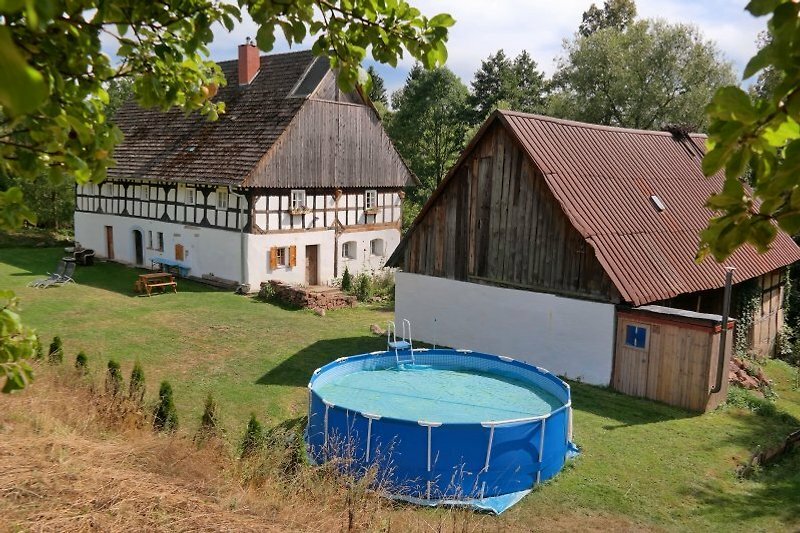 Empfehlenswertes Ferienhaus, wunderschön gelegen, original eingerichtet. Wir waren im Herbst dort, das Wetter war schlecht, aber man konnte sehen, dass der Garten im Frühling und Sommer schön sein sollte. Für Interessierte in Landschaft, Geologie oder Geschichte gibt es in kurzer Entfernung viel zu sehen. Du musst ein bisschen Geschick haben, um Feuer zu machen, der Vermieter gibt hervorragende Erklärungen wie alles funktioniert. Thank you for your very kind review Edwin. Being able to make a fire is a useful skill for those days when the weather is not so good but yes indeed, instructions and guidance can be given to those whose ability has not been put to the test for some time. Wir haben uns sehr wohl gefühlt in diesem urigen Ambiente. Das Haus ist liebevoll eingerichtet und wir haben alles vorgefunden, was wir brauchten. Die Umgebung ist reizvoll und es gibt zahlreiche Ausflugsmöglichkeiten. Wir können das Haus wärmstens empfehlen. Die Gastgeber sind sehr freundlich und hilfsbereit.Wenn Sauna und Pool noch erneuert werden ist alles bestens. Brakuje słów żeby opisać jakie to były wakacje! Dom jest po prostu nadzwyczajny. Cudownie stary, ale jednocześnie bardzo wygodny. Duża przestrzeń, wygodne sypialnie, czysta pościel i przestronna łazienka dają możliwość wspaniałego rodzinnego wypoczynku. Jak tam się śpi! Osobną sprawą jest okolica. Wygasły wulkan, piękne góry, urokliwe miasteczka, pałace, zamki. Naprawdę chcielibyśmy tam jeszcze wrócić! Wunderschöner und sehr besonderer Ort zum Ausruhen und Entspannen! Das haus ist mit sehr viel Liebe zum Detail eingerichtet und mindestens so schön wie auf den Bildern zu sehen. Die Kamine sorgen für ganz besonders viel Gemütlichkeit. Die Küche und das Badezimmer sind perfekt ausgestattet. Es gibt jede Menge frische Handtücher und alles ist sehr sauber und ordentlich. Das Grundstück um das Haus herum ist riesig und toll zu erkunden. Die Gastgeber sind sehr freundlich und hilfsbereit. Ein wunderbarer Ort zum Weiterempfehlen!!! 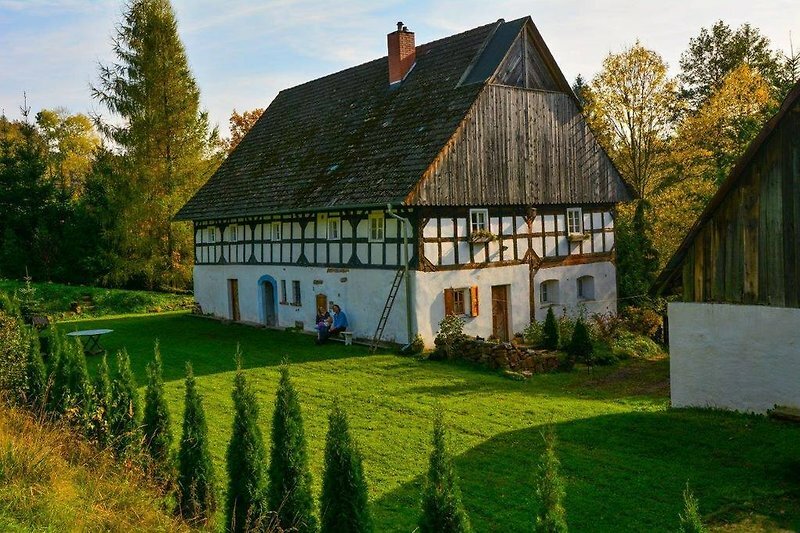 This is probably the best preserved old farmhouse we (4 adults, 1 child) have ever seen in Poland, set in a beautiful valley in a land of extincted volcanoes. In fact, the volcanoes are so closeby, there is one at the top of the garden and a further 2 within the woods a short walk away. There is an even bigger volcano about 5km away (I can't remember the name) which can be reached from the house on feet. We were very happy that we could walk through the garden and meadow to the landscape park behind the house and watch the Karkonosze Mountains in the distance, leaving our cars behind. The children loved it! Paul and Anna were fantastic hojsts and gave us very detailed information about the area, including maps and a folder about what to see and do during our stay. 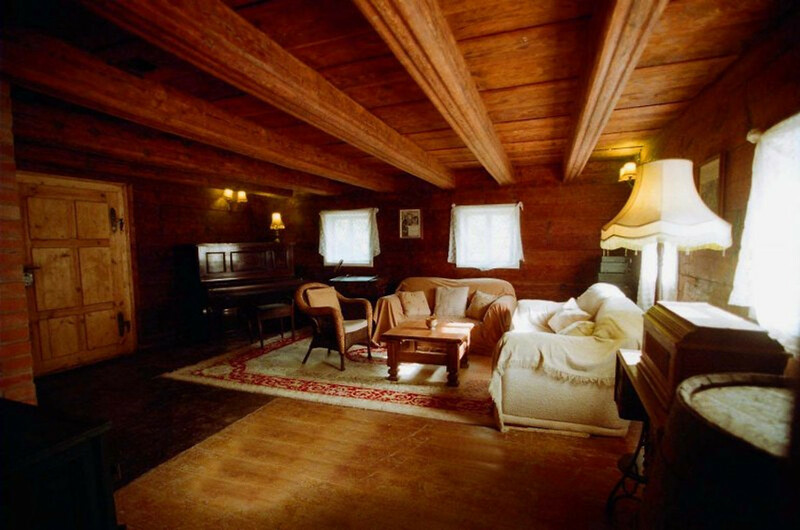 The house itself is very cosy and clean in a rustic style (the reality is much better than the photos)and we particularly loved the piano in the music room downstairs where we would spend our evenings playing music, singing and just relaxing by a wonderful fireplace. We will come back but for much longer next time! Thank you Jolanta. We think it's important too that guests can walk easily from the house and quickly be amongst the beautiful nature here. The large volcano incidentally is called Ostrzyca (Spitzberg in German). At 501m it dominates the local landscape and is about 90 minutes walk to the summit from the house. For everyone who is interested in volcanoes, there is now a brand new, first class, educational centre in Dobków (20km away) for people of all ages - especially children. Here you can discover more about the local volcanic landscape from beautiful displays, film shows, interactive presentations, an earthquake simulator, and passionate, knowledgable guides. It’s a little sad that people can be somewhat disingenuous in their “reviews” when the problems this group encountered lay elsewhere and beyond our control. One couple had to go home early due to a sick child followed by another couple with child the following day again due to sickness, leaving our intrepid “reviewer”. We couldn’t understand that, for a group that never showed any interest in using the sauna, either in our multiple correspondences or our 2 hour introduction to the house, a complaint was made about it. At the moment, the sauna is out of action due to the stove here overheating dangerously. As such, it was fairly obviously not in use due to the wide array of safety features left in there as work in progress (it has temporarily been removed from the listing). Similarly, we don’t think the lamp they left behind the piano to inspect a single cobweb or the small amount of unused washing powder in the tray of the washing machine (which they had been inspecting) constitutes “unclean” or “dirty” Rather, it seems a little desperate to find fault. Let’s address some of the other concerns mentioned. It is true that the Children’s Room (the third bedroom) is only accessed via the main bedroom. No guest over the last 5 years has ever mentioned this as a problem but 1 complaint in 300 is one too many for us so we’ve now added a floor plan to the website. We do have a third bathroom but it’s currently private (we are hoping that guests will have access to this by the summer) as such this has been removed even though it looks like an error in the way that the Ferienhausmeite web-page editing is set up, as all the criteria applied but the total came to 3 instead of 2 - and not an attempt by us at deception. The smell of coal in the house? This is too absurd to even comment on. 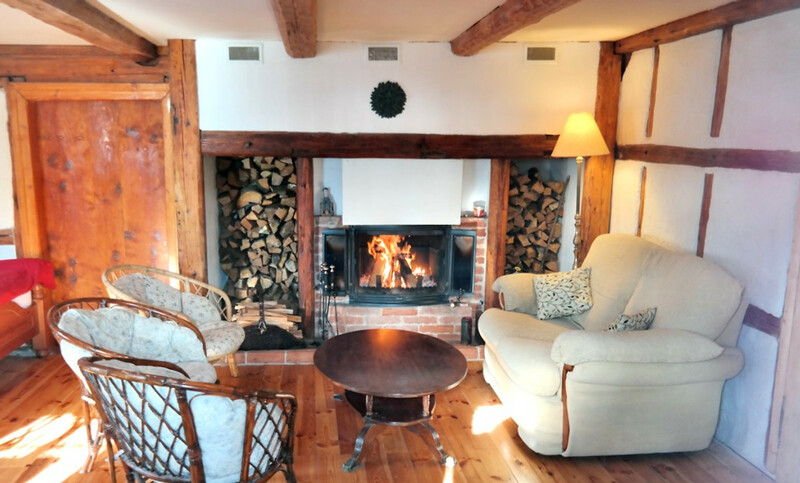 In the winter time, guests have the option to make the fire in the stove themselves or to have somebody call once a day to do it for them. Again, nobody has ever complained or even mentioned this as an issue. “Unattractive surroundings”? Within a stone’s throw of the house is the former family home of Wernher Von Braun on one side and Von Zedlitz’s Palace on the other. It’s quite improbable that these very wealthy people would have chosen such an unattractive location as a place to live. Within about 100m of the house incidentally, lies an extinct volcano – practically adjacent to the 1 hectare meadow of ours. From here, superb views of the Karkonosze Mountains can be had on any clear day. Spartan? I don’t know many houses which can boast a 19th century pulpit from Oxford University, a bidet, Victorian bath, a wet room, 3 sofas in one room alone (the Music Room) 7 sofas in total, 2 wood-burning stoves, dining seating for 12, 2 hifi systems, a coffee grinder, enough cups, plates, cutlery etc for at least 20 people, an antique glass cabinet with 70-80 pieces of glassware, an extensive collection of children’s toys, games, books and puzzles, a piano, a 4000 euro hand-made oak bed – as well as all the usual stuff that every home has. As for the photographs of the house, it’s true, they are a matter of interpretation. You see, I’m not a very good photographer and that’s why practically all our guests tell us that the house is considerably better than the photos. 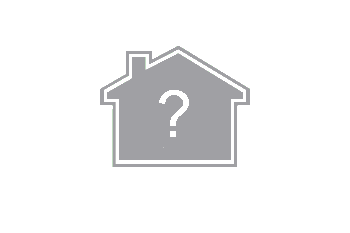 Our reviewer claims the house is low value for money. I’d like to see if anyone could get such quality for what amounted here to just over 10 euro each per day and if they had bothered to read the extensive number of booklets we send to every guest they would find that there are an extraordinary number of things to do and see in the area. 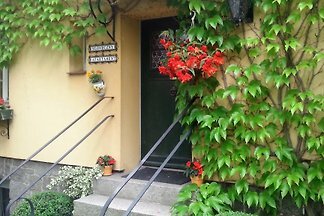 Finally, being fairly new to Ferienhausmeite, we don’t have many reviews. We get far more bookings from Airbnb, Tripadvisor, Homeaway etc. If you care to find us on any of these sites, you will see that no one has ever given us less than 5 stars. The conclusion being that the reviewer was a 1 star guest in a 5 star house. 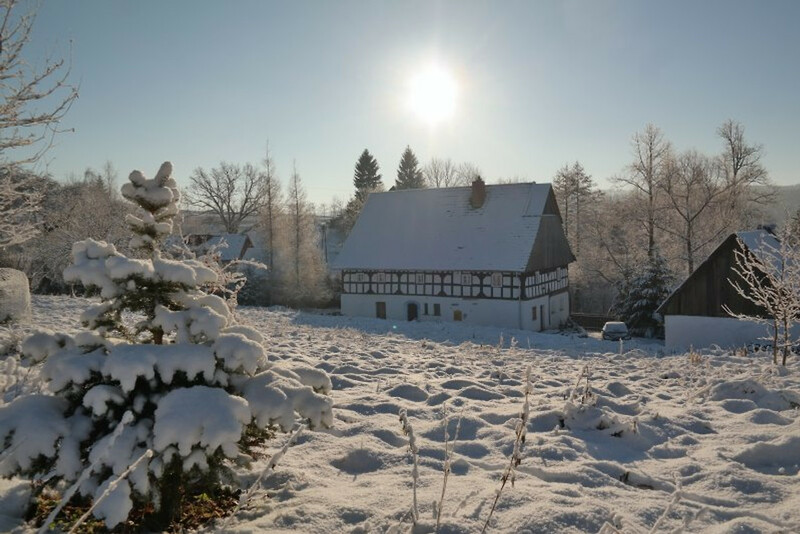 Wir haben in diesem charmanten Umgebindehaus eine sehr schöne Winterferien-Woche verlebt. Das Haus ist liebevoll renoviert und gemütlich eingerichtet. Holzbalkendecken und knarrende Dielen unterstreichen den Charme des Hauses, die ein oder andere klemmende Tür hat uns nicht gestört. Das Haus war für 6 Erwachsene und fünf Kinder ( 1,1/2 - 4 Jahre) ausreichend groß. Besonders die Küche mit dem langen Esstisch war beliebter Treffpunkt nicht nur zu den Mahlzeiten. Die Kinder konnten den großen Garten durchstreifen, auf Bäume klettern und den hinter dem Grundstück liegenden Vulkankrater erkunden. Anna und Paul sind herzliche, hilfsbereite Gastgeber, die uns für Ausflüge viele Tips gegeben haben und über die Region und die Geschichte des Hauses viel erzählen können. Die Region ist landschaftlich sehr reizvoll, es gibt tolle Burgen zu besichtigen und Berge zu besteigen und zum Riesengebirge ist es nicht weit. Eine absolute Empfehlung für einen Urlaub auf dem Land mit urigem, außergewöhnlichem Ambiente. Wir haben uns sehr wohl gefühlt in diesem urigen Ambiente. Das Haus ist liebevoll eingerichtet und wir haben alles vorgefunden, was wir brauchten. Die Umgebung ist reizvoll und es gibt zahlreiche Ausflugsmöglichkeiten. Wir können das Haus wärmstens empfehlen. Die Gastgeber sind sehr freundlich und hilfsbereit.Wenn Sauna und Pool noch erneuert werden ist alles bestens. 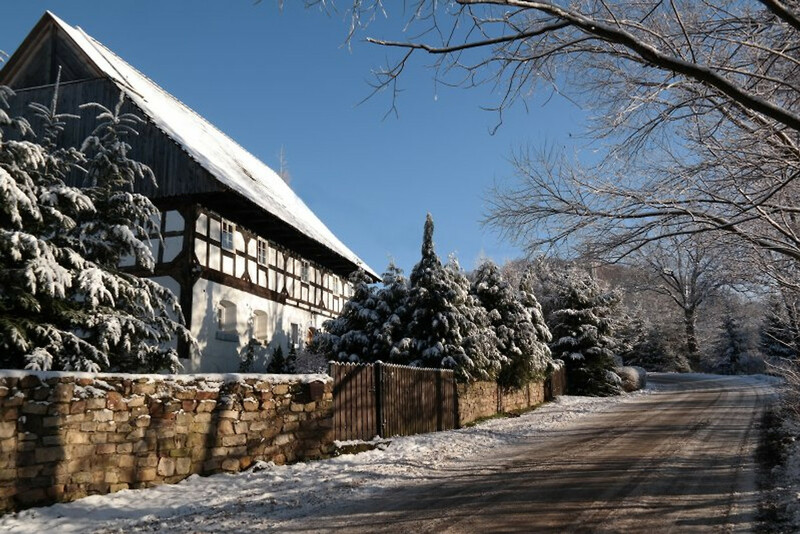 Wir haben in diesem charmanten Umgebindehaus eine sehr schöne Winterferien-Woche verlebt. Das Haus ist liebevoll renoviert und gemütlich eingerichtet. Holzbalkendecken und knarrende Dielen unterstreichen den Charme des Hauses, die ein oder andere klemmende Tür hat uns nicht gestört. Das Haus war für 6 Erwachsene und fünf Kinder ( 1,1/2 - 4 Jahre) ausreichend groß. Besonders die Küche mit dem langen Esstisch war beliebter Treffpunkt nicht nur zu den Mahlzeiten. Die Kinder konnten den großen Garten durchstreifen, auf Bäume klettern und den hinter dem Grundstück liegenden Vulkankrater erkunden. Anna und Paul sind herzliche, hilfsbereite Gastgeber, die uns für Ausflüge viele Tips gegeben haben und über die Region und die Geschichte des Hauses viel erzählen können. Die Region ist landschaftlich sehr reizvoll, es gibt tolle Burgen zu besichtigen und Berge zu besteigen und zum Riesengebirge ist es nicht weit. Eine absolute Empfehlung für einen Urlaub auf dem Land mit urigem, außergewöhnlichem Ambiente.